danibyham: But Who's Going to be MY Cheerleader? 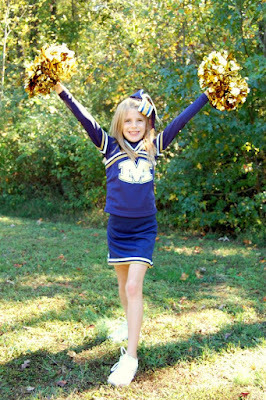 In middle school and high school, I cheered for several basketball and football games. The camaraderie of the team and the rush of being part of something exciting were always thrilling to me. Later, when my daughter was in elementary school and wanted to join cheerleading, I became her coach for a few years. Then, it was the joy of teaching little girls how to memorize dozens of cheers and seeing them shine on the field performing much rehearsed routines that called me. The confidence and friendships they earned from weeks of working together brought me back every week. I loved it. 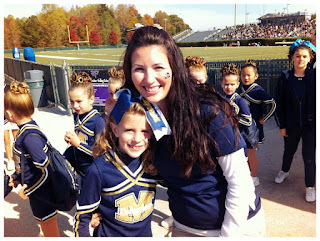 As a parent, I continue to cheer for my kids and my family, with or without the pom poms and uniforms. When my son or daughter scores a goal or nails a routine, I'm out of my chair screaming for them! When they bring home that classroom award or good grade from school, I'm patting them on their backs and bragging on them at the dinner table. When they remember their manners or offer to help Mom around the house, I'm throwing all kinds of "Great job!" "Way to go!" "You're awesome!" phrases in the air. Whether they show it or not, I know it is important for them to hear that encouragement as often as I supply it. But what about me? Who cheers for Mommy when I finally fold and put away that mountain of laundry that everyone notices but no one attempts to move. Where are all the "Atta girls!" when I manage to conjure up three meals a day that every family member approves of? What about the rides, and the homework help, and the things I remember for everyone every day? Who's going to be MY cheerleader? It's been said over and over again, that the job of Mother is a thankless one. Once a year, in the spring, our families rustle up some sweet gifts and cards to tell us we're loved and appreciated, but on a day-to-day basis, we keep doing things for others without much recognition. There are times that someone remembers to say, "Thank you." But unfortunately, even the little ones get preoccupied in their own work and play that it's more often that they forget to notice. They forget because you're always there. It's easy to take a thing or a person for granted when the house is running smoothly. We keep up with the calendar and the dishes. If the mom drops the ball, that's when we are more likely to get noticed. And that's not usually the kind of attention we want, is it? We just can't expect chants and cheers for every mission accomplished- at least not from the people around us. Our cheer section is a whole heaven full of angels. We ARE noticed. As many times as I recognize the inattention from my family, I, myself, should also see how often I forget to focus on what is true. Our goal is to do the work God has called us to do, even when we are not receiving any accolades. The encouragement is knowing that we don't have to go it alone and we are doing a great work! Zephaniah 3:17 (GW)- "The Lord your God is with you. He is a hero who saves you. He happily rejoices over you, renews you with his love, and celebrates over you with shouts of joy."